The Orange-bellied Fruit Dove, Ptilinopus iozonus, is found in New Guinea, the Aru Islands and western Papuan islands where it inhabits lowland rainforest, secondary forest and mangroves. This species has also been recorded from Boigu Island, Queensland, Australian territory in northern Torres Strait. The dove is small - measuring 21 cm in length length. The plumage is mostly green with a large orange patch on the lower chest and belly, a small lilac shoulder patch, pale yellow undertail coverts, and a grey terminal band on the tail. 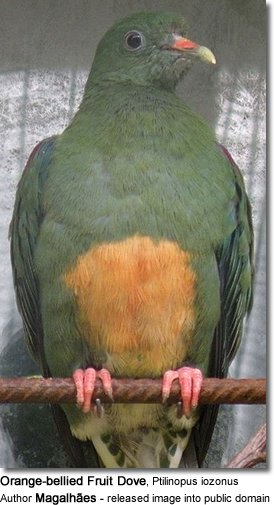 The Orange-belleid Fruit Dove mostly feeds on fruits (primarily figs) taken from trees. The Orange-bellied Fruit Dove lays a single egg on a platform nest of small sticks. The nest is usually situated high in forest trees.